The Earth's axis of rotation is not perpendicular to the orbital plane. The tilt is about 23.5° and the result is that for half of the year the Northern Hemisphere is inclined toward the Sun and for the other half the Southern Hemisphere is inclinded toward the Sun. The two other points in Earth's orbit where it has the maximum possible tilt towards the Sun are called Solistices. The June Solistice, for the Northern Hemisphere and the December Solstice for the Southern Hemisphere. There are also two points along Earth's yearly orbit around the Sun where the Earth's axis is neither tilted towards or away from the Sun, these points are called Equinoxes. At the March and September equinoxes, the length of the day and the night will be nearly equal for all latitudes. You may know that the Earth's orbit around the Sun is not perfectly circular and that the distance to the Sun varies throughout a year, but the effect of this variation is not significant when compared to the effects of Earth's tilted axis. Seasons are caused by the tilt and the variation of the length of day it causes. You can easily see the variation caused by this tilt if you set your location either far North or far South and steps through a year in the Monthly Calendar view. You will see the change in the length of the each day. If you have your latitude set to more than 66.56° North or South you will see that there are periods during the year where the sun never sets or rises. We can also see it using the Planisphere, will we be located on the equator at the June Solstice, time control will be set to 1 hour. Press the forward button until the Sun has completely crossed over the sky. Change the step size to Month and press the forward button 3 times, this will bring us to the September Equinox. Change the step size to Hours and press the back button until the Sun has completely crossed the sky. Change the step size to Month and press the forward button 3 times, this will bring us to the December Solstice. Change the step size to Hours and press the forward button until the Sun has completely crossed the sky. You should end up with having 3 lines crossing the sky, the middle line should go straight from east to west through the zenith, this is at Equinox (where neither Hemisphere is tilted towards the Sun. On this date, if you were standing on a point along the equator the Sun will rise directly to the East move straight up, cross directly through the zenith, and set directly to the West. 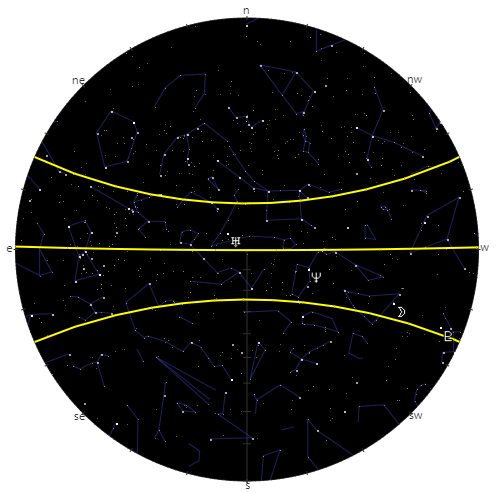 The other two lines will show the effect of having the Northern hemisphere tilted towards the Sun (the June Solstice), and the Southern hemisphere tilted towards the Sun (the December Solstice). The above is what you should get if you follow the instructions above and the image below is what it will look like from 69° North. As you can see the Sun never sets during the June Solstice. It makes a complete circle in the sky, this is called the midnight sun. 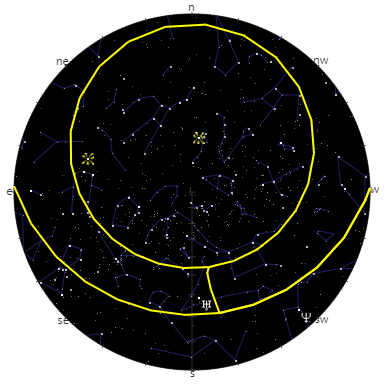 During the December Solstice the Sun never rises so the 3rd line is not visible. You can use the Planisphere to make one for your location as well.